Hiking the ridgelines at the Bashang Grasslands. 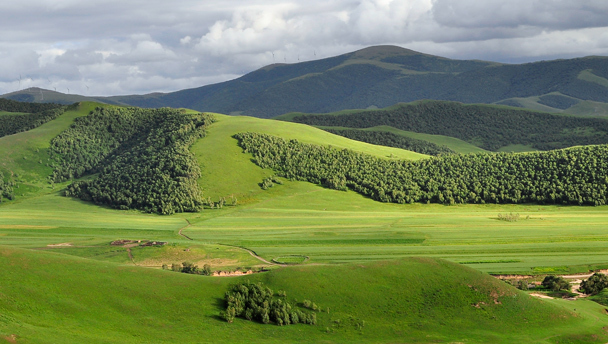 Sited on the junction of the Mongolian Plateau, the Inner Mongolia Grasslands, and the North China Plain, Bashang is a photogenic place of beauty with a cool climate and an interesting history. The wide, flat Mongolian plateau slopes gently down towards the mountains north of Beijing, providing an easy way for the raiding horsemen of Genghis Khan to get close to the city, and vice-versa for troops heading the other way. Consequently, the grasslands have been the site of many battles, from ancient dynasties up until the Second World War. These days, the prairie is peaceful, home to nomads and grazing flocks of sheep and herds of cows. 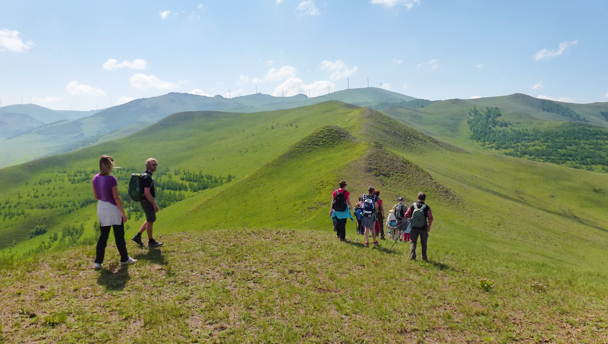 With an average height of more than 1,300 metres above sea level, the grasslands on the plateau are higher than many of the mountains we hike while in Beijing. This means that the temperature is lower than that of Beijing: freezing cold in winter, but cool and refreshing in summer, with temperatures expected to be around 20°C during the daytime – about 10°C less than the expected temperatures in Beijing for the time of year that we will be visiting. 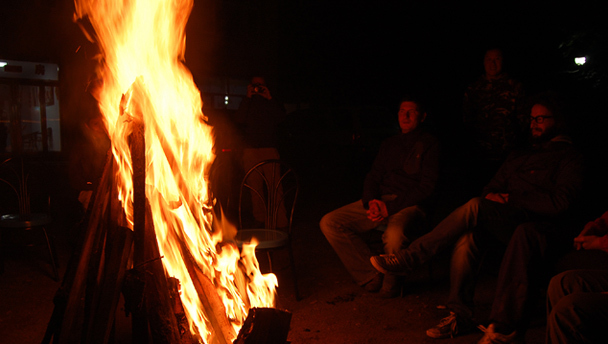 On this trip, you’ll explore the flowery grasslands and rolling hills on foot, and enjoy a bonfire, BBQ, and stargazing in the broad night skies. Day One Private bus to Bashang (5–6hrs), overnight in guesthouse. Day Two Hike through “Hundred Flowers Valley” and “Lover’s Valley” (approx. 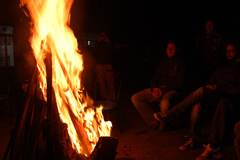 17km, 5 hours of hiking, difficulty level 4), free time, dinner, bonfire. Day Three Loop hike to “Spirit Wall” Mountain. (approx. 11km, 3–4 hours, difficulty level 3), private bus back to Beijing (5–6hrs). For this trip, you'll meet the bus at the same pickup points as we use for our day hikes: close to Exit B of the Liangmaqiao Subway Station on Line 10; and at the Lido Metropark Hotel Starbucks Coffee shop. See our where to meet before a hike page for more details. 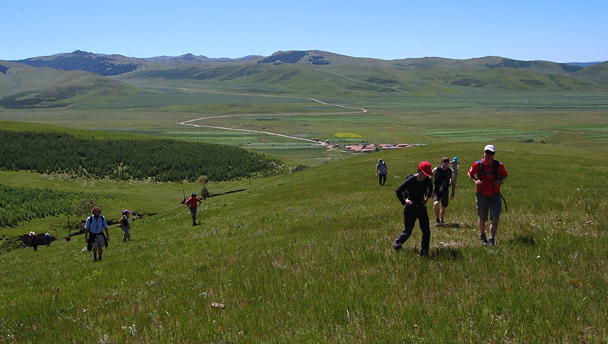 Take a walk in the hills of the Bashang Grasslands. Setting out after breakfast on Saturday morning, we'll board the bus for a short drive from our guesthouse to get out into the hills. The hike begins with a fairly easy walk up into a valley, before a short climb that crosses a low point on a ridge. On the other side of the ridge we'll spot the new Seventh Ring Road, which has, unfortunately for us, been built right through the middle of the grasslands. We'll walk past it quickly, and will soon round a corner and leave the big road behind us. The next part of the hike is another slow climb up on to a ridgeline, steady at the beginning, and a bit steeper as we reach the top. After a bit of a rest we'll be off again, following the ridgeline all the way up to a high point that's almost 2,000 metres above sea level. With the big road behind us, we'll have super views of the rolling hills of the grasslands as we walk through the grass and beside small forested areas. The climb up to the high point is the toughest part of this hike, but it won't take too long, and you'll have a great reward - 360° views of the grasslands. The hike continues down the other side of ridgeline, passing through '100 Flowers Valley' as we get down into the farmland on the other side - at the right time of year the combination of wild flowers and the fields of buckwheat and canola is a beautiful sight! Another long climb takes us up on to another ridgeline, and back to our Seventh Ring Road crossing. Our bus will be waiting for us there, and will take us back to the guesthouse for a huge lunch! We'll ask our local guide to bring his two horses along in case anyone gets tired of hiking, and there are also options to make the hike a little shorter. The hike begins with an easy walk into the foothills, but then we've got a big climb to get up on to the ridge. We'll follow that ridge up to a cairn on another high point in the hills, a scenic location where we'll see rocky crags protruding from the grassy rolling hills. The trail takes us down the ridgeline and then down and out a long valley, skipping over rills in the eroded area of the hills. At the end of the long valley we'll find several farming villages surrounded by fields of squash and melons. We'll walk along the road that joins the villages, keeping an eye out for pigs wandering about. Just after the second village, we'll make another climb up to a ridgeline, and then down the other side to complete our loop hike. As with the hike on Saturday, there's an option to make this walk a little easier. Horses and 4-wheel motorcycles are available for hire from locals at an hourly rate. The cost of hire is not included in the price of the hike because it's not likely that everyone will want to participate in these activities. We can help you arrange rental – the horses cost around 50 RMB per hour; the motorbikes around 30 RMB per hour. They cost a lot more if you break them! There is often quite a bit of pollen in the air in the grasslands. Hayfever/allergy medication may make this trip more enjoyable, especially if you’ve had hayfever in the past. The Bashang Prairie is at an elevation of more than one thousand metres above sea level, and is consequently cooler than the weather in Beijing. The weather is also known to change quickly – sunny one minute, cloudy the next, and then a bit of rain before the sun comes out again. In the week before the hike we’ll send the weather forecast. We will stay in a guesthouse near one of the small towns on the grasslands. You’ll be sharing a room at the guesthouse with another hiker. If you'd like a room to yourself, it can be arranged at an extra cost of 240 RMB, if a room is available—usually not a problem! The facilities at the guesthouse are fairly basic, with a small bathroom that has a basin and a open shower over a sit-down toilet. We’ll drive to and from the trip in a private bus. One lucky (?) person might get to choose which sheep we're going to eat for dinner. Main meals and drinks, plus water to drink during the hikes, are included in the price of the hike. We will take most of our meals at the guesthouse. Bring some snacks and some spending money to buy extras. Please let us know if you have any special dietary requirements or food allergies. With 8–10 people signed up, this trip is all go! Photos from our July 2016 weekender at the Bashang Grasslands. Photos of hills, horses, and hikers taken on our August 2014 trip to the Bashang Grasslands. Photos from our June 2014 weekend trip to the cool and breezy Bashang Grasslands, 280km north of Beijing. Photos from our June 2013 trip to the Bashang Grasslands, including a few shots of the special welcome we received. Click through to see photos from our August visit to the Bashang Grasslands in Hebei Province. We escaped the heat (and flooding!) of Beijing city on this trip to the Bashang Grasslands, north of Beijing in Hebei Province. 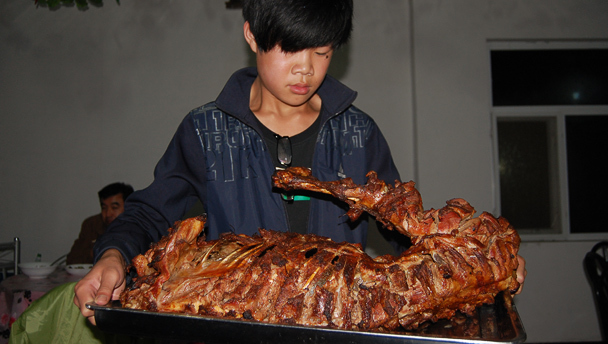 While out there we enjoyed two days of hiking, a big BBQ, and a performance of traditional Mongolian song and dance. Click through to see photos from the trip. For the Dragon Boat Festival holiday we headed north to the Bashang Grasslands for two days of hiking in the grassy rolling hills. Click through to see our photos! On our last trip to Bashang for the year, we saw the beginning of autumn colours and felt some definitely cooler temperatures! Click through to see photos. We escaped Beijing’s summer heat with another visit to the Bashang Grasslands, north of Beijing. We walked, rode horse, saw lots of flowers, and enjoyed the stars! Click through to see photos! We made a long weekend of our visit to the Bashang Grasslands, leaving on Friday afternoon and coming back on Sunday night. Click through to see photos of the rolling hills, grassy meadows, flowers, and animals that we saw while hiking about. In June 2010 we made a two day trip to the Bashang Grasslands in the north of Hebei Province, very close to Inner Mongolia. During the trip we hiked, rode horses, and enjoyed a musical performance by local herdsmen and farmers. Click through for a selection of Huijie’s photos!